Fight against withdrawal of capital into offshore and low-tax jurisdictions by means of the full-fledged implementation of the Law on transfer pricing and Ukraine’s accession to the global system of automatic exchange of tax information, which is formed in within the framework of BEPS plan under the auspices of the OSCE. 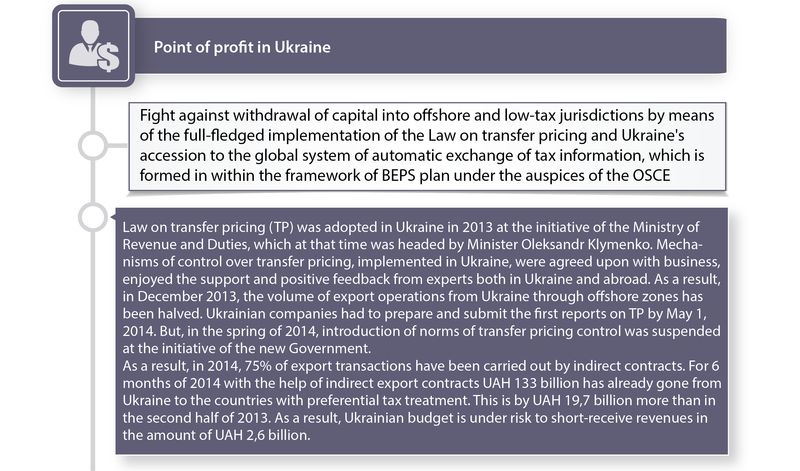 Law on transfer pricing (TP) was adopted in Ukraine in 2013 at the initiative of the Ministry of Revenue and Duties, which at that time was headed by Minister Oleksandr Klymenko. Mechanisms of control over transfer pricing, implemented in Ukraine, were agreed upon with business, enjoyed the support and positive feedback from experts both in Ukraine and abroad. As a result, in December 2013, the volume of export operations from Ukraine through offshore zones has been halved. Ukrainian companies had to prepare and submit the first reports on TP by May 1, 2014. But, in the spring of 2014, introduction of norms of transfer pricing control was suspended at the initiative of the new Government. As a result, in 2014, 75% of export transactions have been carried out by indirect contracts. 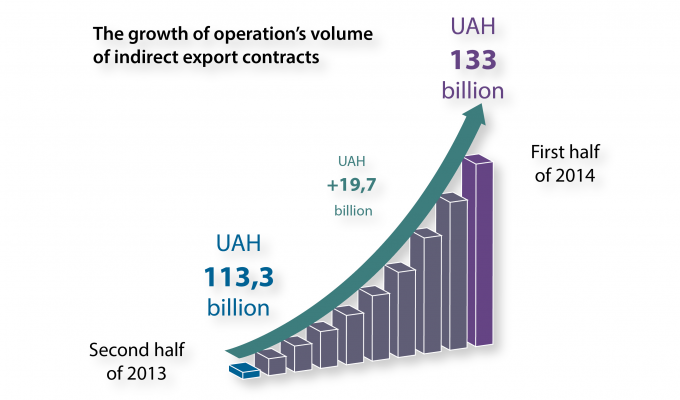 For 6 months of 2014 with the help of indirect export contracts UAH 133 billion has already gone from Ukraine to the countries with preferential tax treatment. This is by UAH 19,7 billion more than in the second half of 2013. As a result, Ukrainian budget is under risk to short-receive revenues in the amount of UAH 2,6 billion.